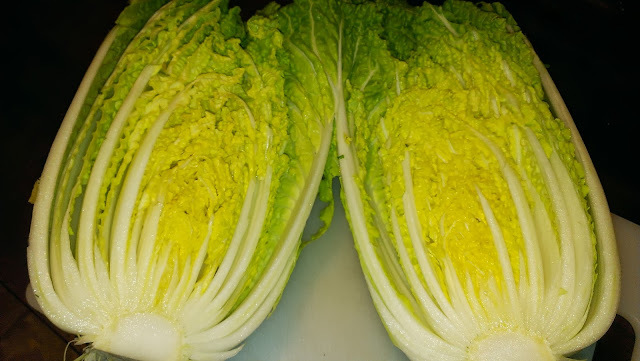 This is the first season I have attempted to grow a Wombok (Chinese Cabbage) and I must say that it has proven to be an easy and a quick grow. In February I raised a punnet (6) of Mini Wombok from seed. They were quick out of the ground and were one of the first seedlings that I raised from seed to go into their beds. They have also been the first brassica that I raised from seed that I have picked this winter. I picked my first last week, it's a beauty. and takes a nip - you're awful Muriel (thanks Baz)! I am glad that I raised Mini Wombok, cause it's a great size - big enough for a couple of feeds but not too big for the fridge and not so big that you groan thinking that you must eat cabbage again this evening. It had no issues with aphids, snails or any other pest but I suspect that it just good fortune rather than some intrinsic characteristic of Wombok. 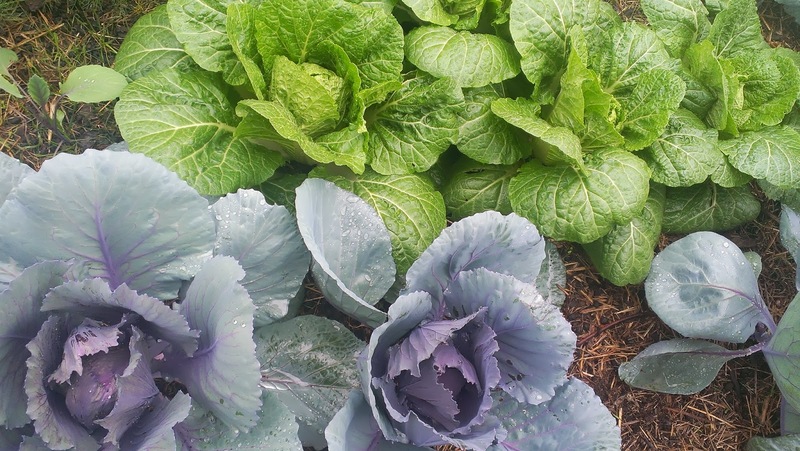 Here is the Wombok growing near the Red Drumhead Cabbages. I am contributing this post to Liz's Saturday Spotlight. The heads could have been tighter but I was happy to pick it and eat it as it was. I've never thought of growing this but you've sold me! Ooh,I hope you don't feel promoted to! They do seem pretty simple and quick and they are two great reason s to take them on. Looks gorgeous. I also love the idea of a mini-sized cabbage. Never grown a wombok though, must put on list for next year! Do you use yours only for asian style meals, or is it versatile enough for european cooking styles? Your question nis hard tyo answer, cause I tend to use them for both styles of meals BUT I am also growing some 'standard'cabbages for Western-style meals as well. Basically I am trying to use what I have being so far from shops. I have recently (this week) decided to not buy any more 'greens' over winter becasue I think I have enough to supply me, but with that takes some decisions about flexibility of produce. Yum! Look better than the pale anemic ones you tend to buy. Will have to try some next year. Perfect for a hot pot of sukiyaki. Yum, good decision. I have so far made just a simple steamed cabbage dish and a stir fry with bacon and spring onions. I will be making a lamb mince and wombok jiaozi (Chinese dumpling) soon but a steam boat with a great stock would be fantastic too. I always nick my dads womboks rather than growing my own - his get huge though so I have been know to compost fair portions of it.... I am always entertained by the amount of things I find nesting between their leaves: worms, earwigs, slugs and even the occasional frog. I think the potential for hugeness supports the mini version. I can imagine those leaves concealing all sorts of things. Mine happened to be pretty unconcelling.